How to Get Tickets to See "The Chew"
Request free tickets to see The Chew online. After your request, you will be notified by email if your ticket request can be filled. Check the website frequently to find newly released tickets. There is a four-ticket limit per request, but there are also ways to request tickets for groups of 10 or more, so if you are visiting with a larger group, don't be discouraged. If you have a group of 10-20 that want to attend a taping of The Chew, you're in luck. Email ABCTheChewAudience@abc.com to request group accommodations and make sure to include some information about your group, as well as three possible dates to attend. Keep in mind the show tapes typically tapes on Tuesdays, Wednesdays, and Thursdays. Stand-by tickets are distributed on the same day as the show tapes at the ABC Television Studios, 30 West 67th Street (between Columbus Avenue and Central Park West) 90 minutes before taping begins, at 7:30 a.m. for the 9 a.m. taping and at 10:45 a.m. for the 12:15 p.m. taping. They might also announce last-minute availability on their tickets page, so check there too. Once you get inside, you will show your ticket voucher and photo ID, then pass through a metal detector and have your bags inspected. You will then be brought to an audience waiting area with bathrooms, water, and snacks. You'll enter the studio based on the different colored stripes on your tickets. The studio seats approximately 150 audience members, 10 of whom will be lucky enough to sit at the tasting table where they will get the opportunity to sample the food that they prepare for the show. Sometimes other audience members get samples as well. Once seated, a warm-up comedian will come out to introduce himself and get the audience prepared and excited for the show. The taping itself lasts roughly one and a half hours, though you'll probably be in the studio for close to two hours. This is a particularly fun taping to attend—the hosts of The Chew interact with a number of studio audience members before taping begins, as well as during breaks between segments. Mario Batali hands out samples to audience members. Clinton Kelly even poses for selfies with a number of audience members after the tapings sometimes. The taping, like the show, has a fun, entertaining vibe and is quite enjoyable. 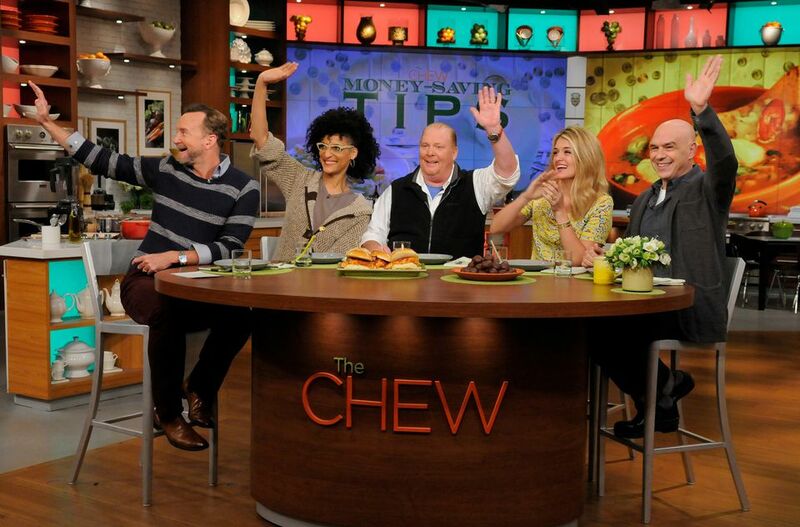 The Chew typically tapes two shows daily on Tuesday, Wednesday, and Thursday. The early show tapes at 9 a.m. and generally lasts until about 11 a.m. The line-up for ticket-holders begins around 8 a.m. and you must arrive by 8:45 a.m. or you risk having your spot given to someone on the standby line. The afternoon show tapes at 12:15 p.m. and generally lasts until about 2 p.m. The line-up for ticket-holders begins around 10:30 a.m. and you must arrive no later than 11:30 a.m. or you risk having your spot given to someone on the standby line. Dress for the weather outside. Ticket holders are often asked to line up along 67th Street outside of the studio before entering the building. We waited outside for roughly 30 minutes before being allowed into the building to clear security. You'll need a photo ID with the name matching the reservation to claim your tickets. Don't forget to bring a print-out of your ticket reservation. Large packages, shopping bags, suitcases, etc. are not permitted in the studio, so be sure to pack minimally. Small purses are allowed. Smart casual dress is suggested. The studio instructions request that folks wear bright, solid colors and look trendy. How to See John Oliver Live on "Last Week Tonight"